Zynga (NASDAQ:ZNGA) has signed a deal with Disney (NYSE:DIS) to develop Star Wars mobile games. The deal between Zynga and Disney will allow the former to develop a new Star Wars game for mobile devices. There’s also the option to develop another game in the series. These are both part of the multi-year licensing agreement. To go along with the ability to create a new Start Wars mobile game, Zynga will also take over live services for Star Wars: Commander. Star Wars: Commander is a real-time strategy game developed by Disney for mobile devices in 2014. It is free to play. “We look forward to extending the reach of the Star Wars universe and developing a new mobile game that entertains players for years to come and has the potential to be a future forever franchise for Zynga,” Frank Gibeau, CEO of Zynga, said in a statement. Zynga notes that its NaturalMotion studios will be handling all Star Wars games for the company. This includes the development of the new Star Wars mobile game, as well as managing the live services of Star Wars: Commander. Zynga doesn’t say what type of Star Wars mobile game it is planning to create. That means that fans of the franchise will just have to wait to see more about the new game. Examples of other games from the company include Farmville, Crazy Kitchen and Words With Friends. ZNGA stock was up 8% as of noon Wednesday. 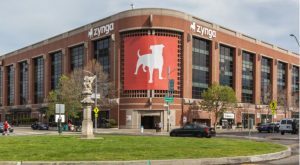 Article printed from InvestorPlace Media, https://investorplace.com/2018/08/zynga-to-develop-start-wars-games/.